The Rev. Sekinah Hamlin (left) of Greensboro, N.C., and the Rev. Dr. Jack Sullivan Jr., of Findlay, Ohio, were among the faith leaders protesting outside the payday lenders conference near Miami. "There are people who need small-dollar loans, but this is a trap," said Cassandra Gould, an African Methodist Episcopal pastor from Missouri. "What they don't need is to have to pay $500 back over and over and over and over again, and then therefore be in a worse financial situation then they started off in." It's been a good year for the payday lending industry. Shortly after taking over as head of the Consumer Financial Protection Bureau, White House Budget Director Mick Mulvaney put tough new regulations for the industry on hold. Since then, stocks for publicly traded payday lenders have shot up. The rules, published before Mulvaney came on board last year, limited the number of loans payday lender could issue to each borrower. The lenders would also have to make sure the borrower had the ability to repay the loan. The industry called it overregulation and stepped up its lobbying efforts. The Community Financial Services Association of America, the payday industry's trade group, booked its annual conference at Trump National Doral. "Any way to gain access or curry favor, they're going to do," said Stephen Reeves, with the Cooperative Baptist Fellowship in Georgia, who came to protest outside the conference. "We've seen this industry is incredibly creative and responsive in the ways it influences — whether it's through lobbyists or campaign contributions. So I don't think this is a coincidence." The industry's efforts have paid off. After being appointed last year, the CFPB's interim director, Mick Mulvaney, dropped a lawsuit against a payday lender. He has been criticized for taking more than $60,000 in campaign donations from payday lenders while he was in Congress. In a Senate hearing last week, he said he's reevaluating rules for the payday industry developed by his predecessor, former CFPB Director Richard Cordray. Mulvaney wouldn't speculate on what the final rules will look like. But he told senators that he questioned whether the federal agency he runs has the authority to pass any regulations of the industry. "The best way to address the problem that you perceive is to pass legislation and not rely on me to do it for you," Mulvaney said in response to a question from Sen. Doug Jones, D-Ala.
Over the past two decades, as states have moved to regulate and in some cases ban payday lending, the industry has downsized. But payday lenders said the proposed federal rules would effectively kill the industry. Jamie Fulmer, with Advance America, one of the largest payday lenders, said Mulvaney's decision to put the rules on hold is a hopeful sign. "Everything that we've seen the bureau issue," Fulmer said, "the comments that the director has made, give us to believe that the bureau will be more judicious in their approach." Payday lenders say they're just responding to a growing demand for what they call "small-dollar credit," a market not being served by banks and credit card companies. Dennis Shaul, the head of the payday lending industry's trade group, said the decision to hold the conference at Trump National in Doral was about golf and good weather, not politics. "We're not naïve about the political process," he said. "We've been involved in it." But he said, "You really do not get much out of trading on someone's name or his past endeavors. That was certainly not a factor when we made this decision here." Although the political and regulatory environment in Washington has improved, payday lenders are worried it could be just temporary. With that in mind, they recently filed a lawsuit aiming to block the payday lending rules from taking effect in August 2019. It's been a good year for the payday lending industry. Part of the reason goes back to White House Budget Director Mick Mulvaney taking over the Consumer Financial Protection Bureau in November of 2017. He put tough new regulations for the industry on hold. Since then, stocks for publicly traded payday lenders have shot up. It's one of the things these lenders are talking about this week at their annual conference at the Trump National Doral Golf Club. From Miami, NPR's Greg Allen reports. 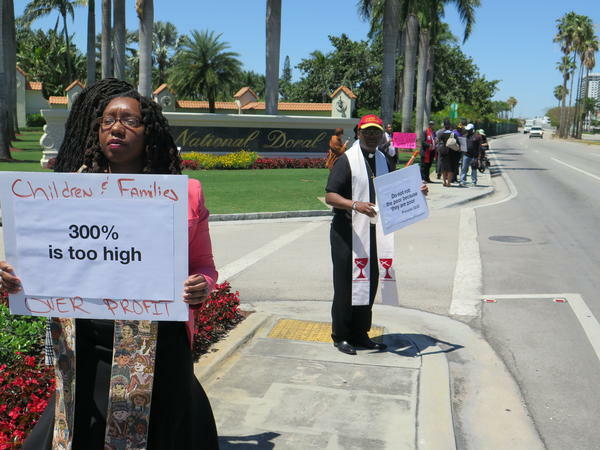 GREG ALLEN, BYLINE: While executives with the nation's payday loan industry met for receptions, breakout sessions and a golf tournament, outside the gates of Trump National Doral this week, there was a small group of protesters. UNIDENTIFIED PROTESTER #1: Show me what freedom looks like. ALLEN: They were religious leaders from Missouri, Georgia, Florida and other states. They are trying to shame an industry that they say preys on the vulnerable by lending them money at interest rates as high as 200 and 300 percent a year. Cassandra Gould is an A.M.E. pastor from Missouri. CASSANDRA GOULD: There are people who need small-dollar loans, but this is a trap. What they don't need is to have to pay $500 back over and over and over and over again. And then, therefore, be in a worse financial situation than they started off in. ALLEN: Last year, the Consumer Financial Protection Bureau published new rules. They limited the number of loans payday lenders could issue in a year. The lenders would also have to make sure the borrower had the ability to repay the loan. The industry called it overregulation and stepped up its lobbying efforts. The Community Financial Services Association, the payday industry's trade group, booked its annual conference at Trump National Doral. Stephen Reeves, with the Cooperative Baptist Fellowship in Georgia, was one of those who came to protest. STEPHEN REEVES: Any way to gain access or curry favor, they're going to do it. We've seen this industry is incredibly creative and responsive in the ways it influences. ALLEN: The industry's efforts have paid off. After being appointed last year, the consumer bureau's interim director, Mick Mulvaney, dropped a lawsuit against a payday lender, and he's reevaluating rules for the payday industry developed by his predecessor. Mulvaney has been criticized for taking some $60,000 in campaign donations from payday lenders while he was in Congress. In a Senate hearing last week, he wouldn't speculate on what the rewritten rules will look like, but he told the senators he questioned whether the federal agency he runs has the authority to pass any regulations for the industry. MICK MULVANEY: The best way to address the problem that you perceive is to pass legislation and not rely on me to do it for you. ALLEN: Over the past two decades, as states have moved to regulate and, in some cases, ban payday lending, the industry has downsized, but payday lenders said the proposed federal rules would effectively kill it off. Jamie Fulmer, with one of the largest payday lenders, Advance America, calls Mulvaney's decision to put the rules on hold a hopeful sign. JAMIE FULMER: Everything that we've seen the bureau issue - the comments that the director has made, you know, give us reason to believe that the bureau will be more judicious in their approach. ALLEN: Payday lenders say they're responding to a growing demand for what they call small-dollar credit, a market not being served by banks and credit card companies. As for the conference, the head of the payday lending industry's trade group, Dennis Shaul, says the decision to hold it at Trump National in Doral was about golf and good weather, not politics. DENNIS SHAUL: We're not naive about the political process. We've been involved in it. And you really do not get much out of trading on someone's name or his past endeavors. That was certainly not a factor when we made this decision here. ALLEN: Although the political and regulatory environment in Washington has improved, payday lenders are worried it could be just temporary. With that in mind, they recently filed a lawsuit aiming to block the payday lending rules from taking effect in August of next year. Greg Allen, NPR News, Miami. Transcript provided by NPR, Copyright NPR.